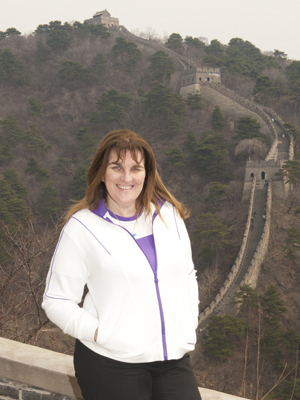 My first time in CHINA: a visit to the Great Wall of China in heels. Beijing, Great Wall of China. Everyone said to me that India is like nowhere else. It’s true, but China goes one step beyond this – it is a world of its own. This is the first of all the countries in the world that I’ve visited where I felt illiterate. You cannot read anything; you cannot even guess the symbols – you are out on your own. Illiteracy: my heart goes out to the illiterate and the world´s education systems must save any child or adult from this, because you do not realize what this paralysing handicap is like until you have first-hand experience. The first mishap of the trip occurred when my tripods didn’t arrive at the airport – the tripod bag also contained my shoes. I arrived on a Saturday night and on Sunday morning I was invited on a trip to see the Great Wall of China, the most famous wall in the world, with the Dot Green Foundation, a Californian non-profit which supports, and raises funds for, sustainability projects and programmes. The Great Wall is one of China’s most famous monuments, dating from the 7th century BC. This extraordinary structure – which, contrary to popular belief, is not visible from space – is 8850km long and is built from various materials including stone, bricks, earth and wood. The only pair of shoes that were not in the tripod bag were a pair of heeled boots, so what do you do – miss out on a bucket-list experience, or brave it and take a chance? Yep, that’s what I did – I went to the wall in high heels. As I was wearing trousers noone seemed to realize, and anyway as a photographer everyone expects you to be either ahead or trailing behind the crowd to get good photos. 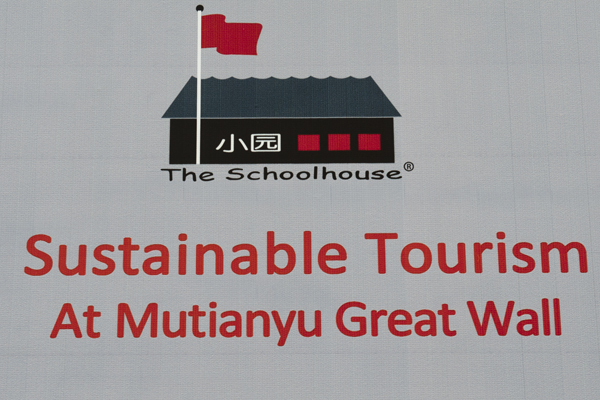 We left Beijing via bus, stopping for lunch at The School House at Mutianyu, a sustainable initiative founded by American Jim Spear and his Chinese-American wife Liang Tang in this village next to the Great Wall, about an hour from Beijing. Their initiative started with an abandoned primary school, and they now have several hotels and restaurants, including an eco-retreat and spa in a converted tile factory offering yoga, an art gallery, and various other projects. The couple also offer free community services: foreign students can make home visits to elderly Chinese in local villages, with interpretation services provided (guided tours of the surrounding area for tourists are charged). TWO FEMALE FOUNDERS. 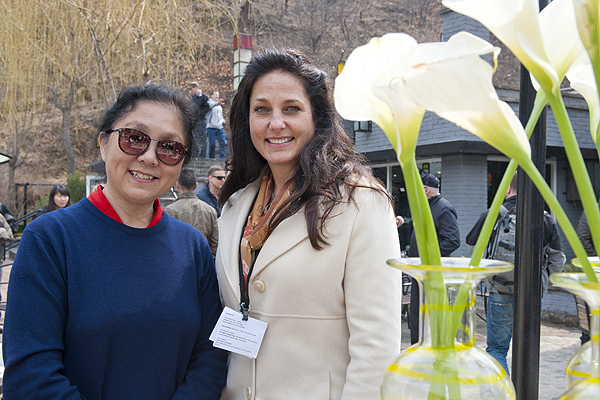 Liang Tang of The School house with Annalisa Roger from The DotGreen Foundation. This converted school – Chinese who became wealthy from tourists visiting the wall sent their children to schools in Beijing – and the rest of the projects are all run ecologically with solar power, composting, recycling and strictly-controlled energy consumption. 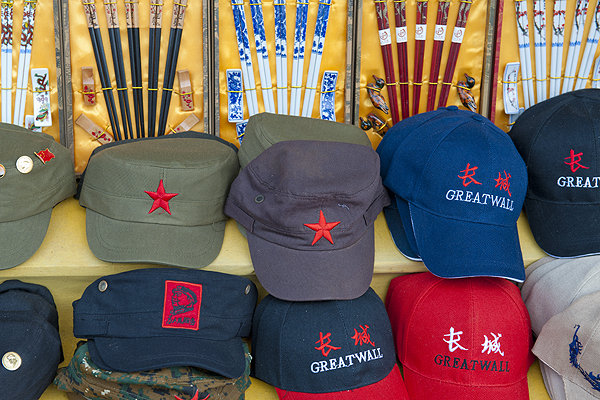 Beijing Great Wall of China, baseball caps and chop sticks. We had a steep climb from the village through tacky stalls of souvenirs, fur hats, baseball caps, dried fruits chop sticks and imitation silks, then a hair-raising ride on a chairlift held in by a rusty bar. Every time the steel cable passed over the supporting towers, the chairlift made an unnerving creaking sound and my seat jerked. I was in the chair on my own and in front of me a young German chap was frozen with fear. At every tower, with every jerk, I thought my time was up, glancing down at the treetops far below, and not fancying the death drop fall. Two men in long coats with big buttons and wearing fur hats pulled me off the chair onto my heels and off I went to discover the Mutianyu wall on a cold crisp day ahead of the crowds. 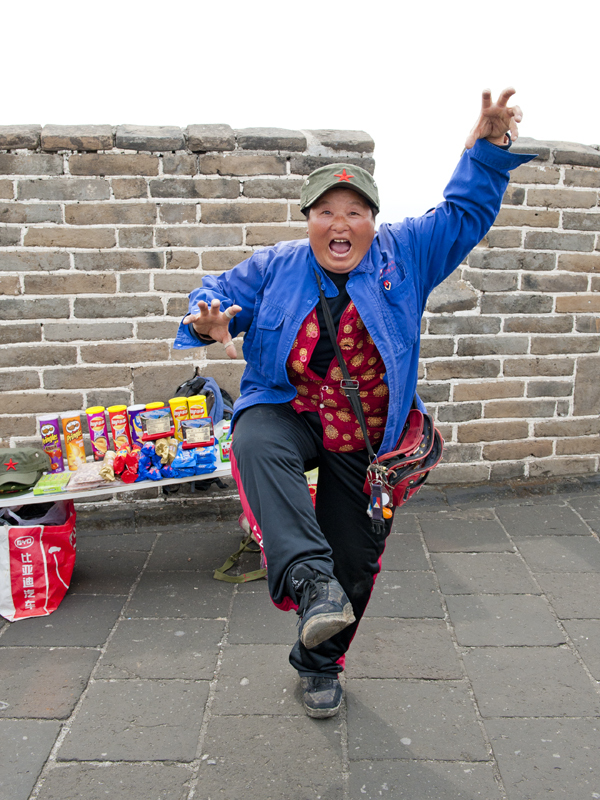 A woman in a military outfit, with a red star on her hat, selling sweets and postcards and fridge-magnets, asked me if I wanted to hold a Chinese salute pose (like you do) and she would photograph me with one leg in the air – this was all communicated in sign language. So I held my leg in the air imitating her, then she saw the heel of my boot and doubled over laughing. The postcard seller with her repertoire of photography poses. I hobbled up the wall to an observation tower. Now these postcards showed images of blue sky days and trees laden with cherry blossom, but today was a white sky and there wasn’t a tree in bloom; this was the week when the trees should bloom, but they refused. Rightly so – too darn cold. 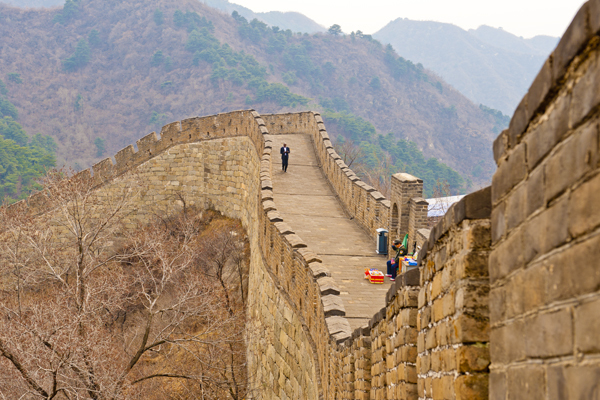 I´m glad I’ve seen the Great Wall: it stretched for thousands of miles – I didn’t walk that far, but exercised my eyes, scanning this magnificent architectural feat, extending as far and the eye could see in both directions. My visit to the Great Wall of China. What really made my day was the toboggan ride down. I sat in a flimsy plastic seat with tourists and locals, winding down what can only be described as a stainless steel tunnel cut in half, with my legs half in the hair and high heels sticking out. I thanked my lucky stars – it could have been worse, I could have decided to wear a skirt! There were folk screaming in front and behind as we zig-zagged down, and at every turn a man with a long buttoned military coat, gloves, and a winter hat, worthy of a full-page photograph in Vogue, laughed or pointed at my feet and an English voice said “SLLLOOOW DOWN!” over the tannoy. It was surreal. This wall was apparently built to keep out the Mongols and at the bottom, someone was offering… a photograph with the Mongols pretending to cut your throat. 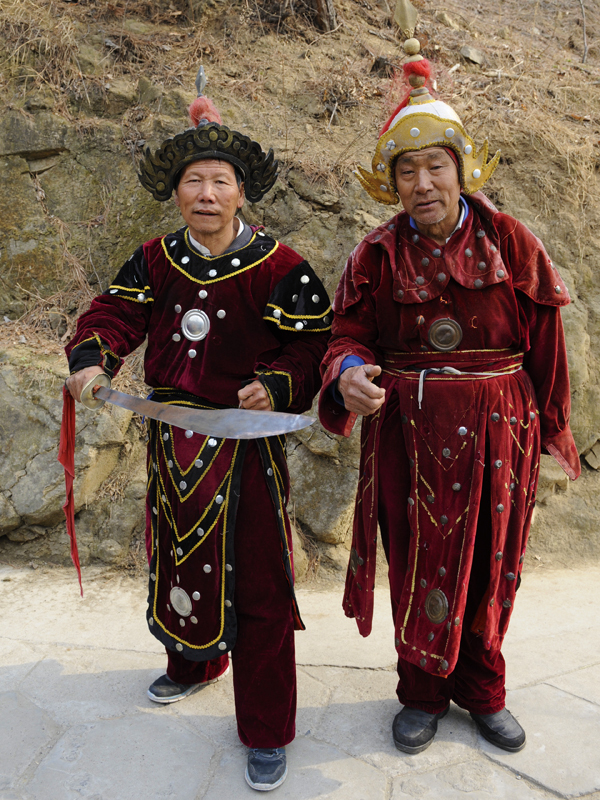 Would I like a photograph with the Mongols cutting my throat? 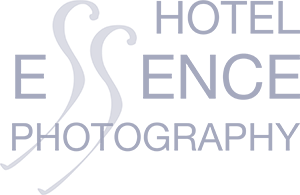 I’ve seen it now, it was an experience – I had the photo taken, I bought some tack in the market and, thankfully, the rest of my shoes arrived at the hotel the next day. I remember being there on a stupidly hot day and no sunglasses for some reason. That hurt! I was terrified of the toboggan – as if it would break. I was so slow I annoyed everyone. Oh well! Honestly the toboggan was beyond words, mine went too fast and its a long story, but I had a real stunt man behind me and I think he thought I was going too slow, but he did kindly offer to carry my rucksack, so I´m not complaining at all.